The EMU soccer women are still looking for their first goal of the year after a 2-0 loss at Goucher Saturday afternoon. EMU’s soccer women return to Harrisonburg 0-2 after their season-opening trip to Baltimore, Md., as they prepare for next Wednesday’shome opener. Goucher got on the board in the 26th minute in their match, getting a score after a scramble in front of the net after a free kick. Forward Nora Osei (Springfield, Va./West Springfield) had a shot saved less than two minutes later, keeping the Royals off the board. But in the 64th minute, the Gophers struck again, making it 2-0 on a breakaway goal. Eastern Mennonite had a good chance to score on a corner kick with 10 minutes to play, but Osei’s first shot was blocked and her follow-up sailed high as Goucher held on for the decision. The Gophers had a 16-5 edge in shots as Becca Borg (Gig Harbor, Wash./Peninsula) made five saves in goal. 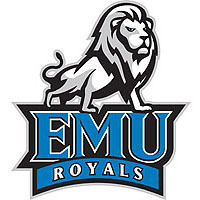 Amanda Williams (Millsboro, De./Delmana Christian) and Sara Shenk Moreno (Harrisonburg, Va./Harrisonburg) had EMU’s other shots. The Royals hope to take advantage of three straight home games as they look to build a little momentum before the ODAC season. That stretch starts with Southern Virginia this coming Wednesday. Start time is 4:30pm. A free video webcast will be available for the contest.